If you’re looking to increase the value of your home, you’ve probably considered sprucing up the interior. But with outdoor space becoming increasingly important to the modern day homeowner, your garden isn’t an area you should overlook. When it comes to kerb appeal, nothing says a well-loved house than a professionally landscaped front garden. It’s the first thing anyone who enters your home will see, so having it professionally landscaped is a good investment. Indeed, a survey conducted by Barclays Mortgages revealed that house hunters take just ten seconds to decide whether they like the house based on the exterior of a property, and 44 per cent of homebuyers would take 20 per cent off of the asking price when offering on a house with an unruly exterior, so it pays to have your front garden professionally landscaped to create that all important first impression. Some estate agents have estimated that well looked after outdoor space can increase the value of your home by up to 20 per cent. You don’t need acres of land to increase the property of your home; any outdoor space, even as small as a courtyard, will help your home’s value, but the key is keeping it well maintained. Having your outdoor space, not matter how small, professionally landscaped will help you to make the most of it. A professional garden landscape company will know of ways to save space, use clever planting and focal points to really create the best garden area for your home. Something that is important when thinking about adding value to your home is how easy it is to maintain your garden. If you are selling your home, not only will this make it easier for you to look after in anticipation of viewings, but many buyers will themselves want a garden which won’t take up lots of their time. This is why having your garden professionally landscaped is so important. 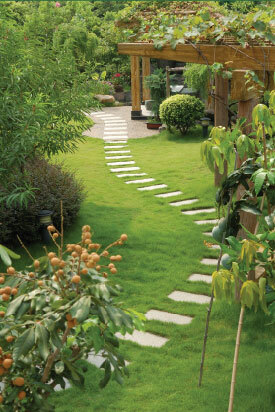 Your landscapers can create a garden which is beautiful, but easy to maintain. Ideas for low maintenance garden include well looked after privacy fencing, areas laid to patio and hard landscaping such as raised borders. If you do have paved areas, make sure that they are clean and weed free, and ask for low maintenance planting so that you don’t have to spend hours tending flower beds. By having your garden professionally landscaped, you can easily add value to your home. In terms of time and maintenance, it’s a great investment if you’re looking to stay in a property for a while, and will add value when you do decide to sell. If you’re looking to add value to your home, contact D&G Garden World to see how we can beautify your garden.